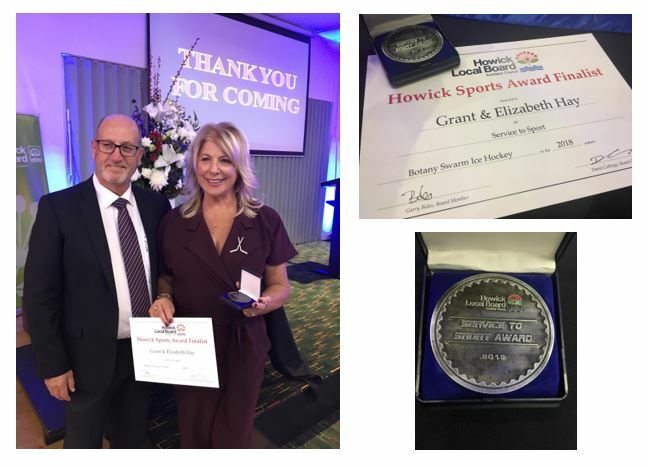 Grant and Elizabeth Hay were recognised for their huge commitment to ice hockey in Auckland and New Zealand at the recent Howick Local Board sports awards held in Auckland. Their involvement with the sport over the past 23 years saw them being acknowledged in the Service to Sport category. Grant’s involvement with the sport started in 1996 when he became the Auckland U16 club manager, a position which he held for eight years then took a break and came back on board during 2009 for a one- year term. His commitment to the national squad also saw him involved over a period of 10 years from 2005 to 2015 as Chef de Mission for various New Zealand Ice Blacks and Ice Fernz teams which travelled around the world to eight championship tournaments. He was the World Championship Tournament Director for the Men’s Division III tournament held in Auckland in 2006 and the Women’s Division II in Auckland in 2013. Grant served as the General Manager of the Botany Swarm national league team from 2005 until 2010 and then again from 2013 to 2017. He also served on the New Zealand Ice Hockey Board from 2002 to 2016 and was President of Auckland Ice Hockey from 2002 to 2010 and New Zealand Ice Hockey from 2009 to 2016. His commitment and dedication along with the support of his wife, Elizabeth is testament to the recognition which they deserve for their service to the sport of ice hockey in New Zealand. Well done and congratulations to you both.